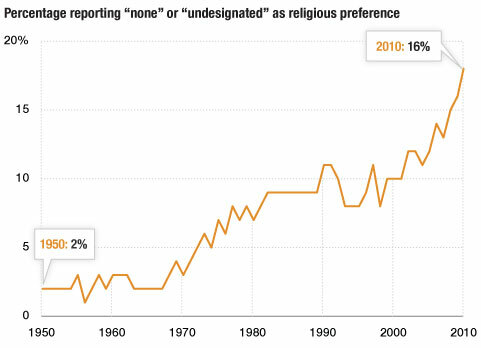 Over the past few years, one hears more and more about the crisis facing organized religion: fewer and fewer young people are coming to worship services, and the share of people who identify as non-religious seems to be growing and growing each year. Sociologists and religious leaders alike interpret this as evidence for the looming death of churches in the coming decades. The panic among ministers, priests, and bishops is palpable. More and more dioceses and parishes are rushing to appeal to the “nones“, to stem the tide, to keep their numbers up. Into this frenzied discussion enters the “spiritual but not religious”, which I wrote about a few days ago: people, by and large, are still seeking spiritual fulfillment, truth, etc. but aren’t interested in religious communities or institutions. Church leaders seem to think that the church must change or die; the writing’s on the wall. I take issue with this whole line of thought on two broad fronts. The first is a demographic skepticism: I’m not so sure that the fact that 1/3 of young people identify as not religious is necessarily the Sword of Damocles over the head of organized religion. Note that this means, presumably, that 2/3 of young people do identify as religious. Considering that we have been hearing about the coming death of religion now for about 200 years, it doesn’t seem to me that we are facing the end of organized religion any time soon. It’s also not clear that this trend will just continue steadily into the future; note how the social and political trends of the 1920s–general social liberalism, a sort of muted libertinism, and a turn away from organized religion–essentially reversed for a few decades, beginning in the 1930s. Then in the ’60s, these trends came back with a vengeance, only to again face a good deal of reversal in the 1980s. Many of these trends may be more cyclical than linear. But of course, there have been left-leaning Christians for centuries, and it’s simply not true that being religious necessarily means being conservative. In fact, the link between the two is probably very recent, the result of the party re-alignment of the 1960s, when Republicans, recognizing their policies were unpopular, sought to shore up support for their plutocratic economic policies by allying themselves with charismatic and opportunistic religious leaders, especially among Evangelicals. The irony is that the Evangelical movement was originally very progressive, for example many English Evangelicals were some of the earliest abolitionists, and the Pentecostal wing of Evangelicalism was largely a movement of working-class Christians who, for example, resisted Jim Crow and sought to build a racially diverse church. And if the main problem for religion today, specifically Christianity, is its identification with reactionary politics, then the answer is relatively simple: stop supporting reactionary politics, which are, by my estimation, profoundly un-Christian anyway. In other words, the Church needs to pursue its real agenda, and not allow itself to be co-opted by the State or the ruling classes. Of course, this co-option has been going on since at least Constantine, but then again, resistance against this co-option, and protest movements and churches, have also been forming since that time, and one hopes that their counter-balancing effect can continue to keep the Church on at least something of an even keel. There’s good evidence, for example, that monasticism itself began as a sort of protest against the co-option of Christianity by political and social elites in the 4th century. And this is where I really see the main threat of all this sky-is-falling public hand-wringing: so many church leaders think that, in order to survive, the Church basically needs to completely re-invent itself to meet the demands, essentially, of its consumers. In this view, the Church is a sort of business, and its losing market share. You actually see this sort of language in the discussion. But of course(?) the Church is not a business, and we don’t have consumers. Right? The danger of all this hysteria is that it seems we could really lose our way here. The threat to the Church is not that we might have fewer members in the coming decades, but that in the process of trying to appeal to a certain demographic of people–we would completely sell out on our real mission–to keep bodies in the pews, as they say. But our goal is not to simply have a lot of members, it’s to serve God, to follow the example of Christ, to act with loving-kindness to all people. If doing this results in many new members, as it seems to have in the earliest centuries, then excellent! And if not, then so be it our, our “business” is to try and perceive the Truth at the heart of reality and respond in obedience and love, not to be the most popular social club on the earth. This, of course, does not mean we should ignore social trends. The Episcopal Church, of which I am a member, ordains both female and gay priests, something that I think it only did under extreme pressure, and perhaps even shaming, from secular voices. And I think this is a really good, wonderful thing. The Church certainly has a lot to learn from secular politics, philosophy, science, etc. We should not bury our heads in the sand or cut ourselves off from other communities. We’ve been wrong about a lot in the past and no doubt will be again. But just because secular society, taken as a whole, has been right about some things doesn’t mean it necessarily will be right about everything. I would certainly submit that though broad secular social pressure for women’s rights, gay rights, the rights of ethnic minorities, etc. have been absolutely correct, in other ways, the same sorts of social pressure are absolutely horrendous. Consumer capitalism, for example, is destroying communities, individuals’ mental health, and the environment, all in one fell swoop. Even a good deal of secular folks decry its materialism and de-humanizing shallowness. The Church was right to finally cede to pressure from the outside to ordain women and homosexuals; I think it would be dead wrong to accept pressure to continue accepting a more consumer-ized economic and social ethic. In other words, secular society has provided a good sounding-board for the Church and has confronted it in many places were the Church desperately needed to be confronted. But the opposite may also–in fact, has also–been true. Let’s not forget that it was Christian leaders who spear-headed the abolitionist and women’s suffrage movements. In many ways, the complacent social and political stance of the churches throughout the 20th century was an aberration. The Church has often been a lone voice in defense of the oppressed, marginalized, and exploited in times past, where political and economic forces were rushing head-long to grind up vulnerable humans to serve the needs of the State and the Market. In recognizing the sins and hypocrisy of conservative Christianity, I think we are really finding our true, traditional voice in many ways. This is not to deny that the Church was ever involved in oppression before the 20th century, of course. There were Christians calling for abolition, but there were also Christians trying to cite the Bible in defense of slavery. There were Christians advocating for women’s rights, but there were plenty obstructing the realization of those rights as well. Many priests and friars called upon the Spanish monarchy to end colonization of the Americas after seeing the horrors of the Conquista; but ultimately the Church obediently supported the Crown in its occupation of the New World and its brutal exploitation of native peoples there. I’m in no way arguing that the Church has always been on the right side of things, up until the 20th century. But I am saying it definitely has not always been on the wrong side of things. But the impression among many young folks, is, I think, that it has been. We simply need to stand up and confront conservative Christians and articulate a counter-narrative, one that is truer, both ethically and historically, than the one they are pushing. And I think this is where we get to the real problem. Moderate, liberal, and progressive Christians don’t have a show comparable to the 700 Club, we don’t have dozens of talk-radio programs broadcast every day. We aren’t in the public eye; we’ve ceded the terrain so completely that in a mere 30 years, Christianity and conservatism have been completely conflated in the eyes of most Americans. This, I think, accounts for our demographic crisis. We’ve rather complacently sat around while the rug is pulled out from under us, and we wonder why people are uninterested in our community. The solution is not, I think, to try and appeal to a consumerized ersatz New Age spirituality, but actually the opposite: we need to embrace so much of our tradition that has been forfeited. This can function in two critical ways: first, as we’ve discussed above, there is a legacy of counter-oppresive, pro-social-justice work in our community, from the very beginning. We need to make this explicit, we need to present a fuller account of our history. This should not mean ignoring or denying the evils and sins of our past, but simply also calling to people’s attention all of the good work the Church really has done, to show that our history, like all histories, is complex and variegated. Second, I think that what so many spiritual-but-not-religious people are seeking they will not find in the various ersatz spiritual movements and groups they are currently investigating. I could certainly be wrong, but I think people are hungry for something that is authentic and even traditional. I think they ultimately will want communities that welcome them with open arms yet also call them to accountability. They want to participate in something that can trace its existence back centuries, that ties them to their ancestors and to essential cultural foundations. For many in the West (by no means all), this means Christianity. But if we attempt to out modernize the the New Agers, we will lose everything that makes us unique and valuable: our traditions, our authenticity, and our heritage. We can accept the critiques of secular society without totally collapsing before them. We can admit the ways in which we have been oppressive, exploitative, and exclusive without abandoning our tradition altogether. And I think this is precisely what we must do. No one can serve two masters, for either he will hate the one and love the other, or he will be devoted to the one and despise the other. You cannot serve God and money. Let’s remember what our real priorities are. Even if the coming decades see a smaller church, we should keep our minds focused and our vision clear: our goal is to seek God and spread the Gospel, not to simply fill pews or build endowments.